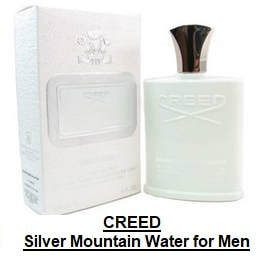 Compare Best CREED Men's Fragrances: Silver Mountain Water, Green Irish Tweed or Aventus? Creed is a French multi-national perfume house, based in Paris. Creed perfumes are composed of the most sought-after olfactory ingredients and almost exclusively of natural components of excellence. ​Olivier Creed, the creator of these fragrances, personally selects the best and most exclusive ingredients during his multiple travels in all parts of the world. That is why one can find in his creations the irises of Florence, the roses of Bulgaria or the jasmines of Grasse. ​For Oliver Creed, the process of inventing a new fragrance, is like the art of painting. He was noted to state that: "Without seeking to liken myself to a genius like Picasso, it's true that, as with the visual arts, when the moment of inspiration comes, you have to seize it, there and then." Description: This fragrance has been a bestseller since it was first launched. Its exclusive scent brings together the purity of soft, milky-sweet blackcurrants mixed with green tea, the richness of bergamot, and expensive fine-grained sandalwood. The resulting fragrance evokes sparkling streams coursing through the snow-capped Swiss Alps and the opaque white bottle it comes in reminds you of the icy snow banks topped with a glistening cap like a glacial silver stream. Classification: Marine / Green / Fresh. Top note: Bergamot, mandarin, neroli. Middle note: Green tea, blackcurrant bud. ​Description: This fragrance delictely brings together woody freshness and pure masculinity, and is equally suited to a stroll through the Irish countryside or a proud walk down the red carpet. 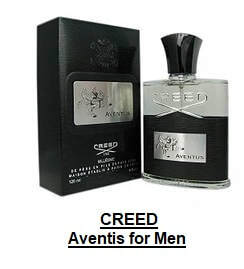 It is one of Creed’s best-selling scents and wearing it is equivalent to being unforgettable. Considered to be a classic, Green Irish Tweed never goes out of style. It has been and continues to be worn by successful and sefl-assured men at the peak of their field. Top note: Lemon, verbena from India, peppermint. Base note:Florentine iris, sandalwood, ambergris. Description: Aventus is an exceptionally sophisticated blend for those who savor a successful life in all respects. Introduced in 2010 and crafted by Olivier Creed and his son Erwin, it is easily the best-selling fragrance in the history of the CREED brand. The iconic name Aventus was derived from the latin words "a" meaning "from" and "ventus" meaning "wind", illustrating the Aventus man ever racing with the wind at his back toward success. Top note: Bergamot, blackcurrant leaves, apple, pineapple. Middle note: Pinkberries, birch, patchouli, jasmine . Base note: Musk, oakmoss, ambergris, vanilla. Please click the fragrance of your choice below for price information or to purchase. Have you not found yet what you were looking for?